We have the FAA-PMA approved Main Landing Gear Door Strut Assembly; part number 25UM781-23A/SS. And if you need to replace any of the part numbers listed, download our documents under the FAA-PMA Info section along with our simple step by step procedures. Our stainless steel struts Never Need X-Ray Inspections and are approved for 18 different Hawker aircraft models. 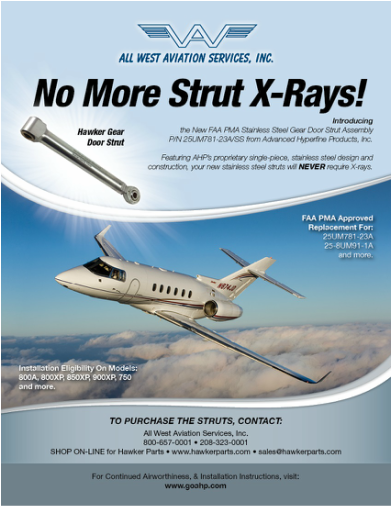 See which models are eligible for the strut assembly under the ﻿FAA-PMA Info﻿ section.